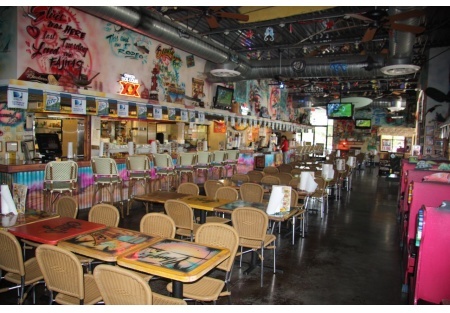 Are you looking for a turn-key full service restaurant that's perfect for a full service Mexican restaurant or perhaps you're looking for a tropical theme restaurant for your seafood and steak restaurant. Or simply convert the whole decor to your desired concept. Either way this restaurant is in a Triple A Power-Center location next to a Home Depot, Pet Smart and Wal Mart center surrounded by several national chain restaurants as well as national retail stores. NATIONAL CHAINS SHOULD TAKE NOTICE OF THIS RESTAURANT AND CONSIDER PLACING THEIR NATIONAL CONCEPT HERE! A regional chain occupied this space and is still operating as the franchise brand. But the franchise is not available for sale. The regional chain has closed just about all their restaurants in the Phoenix market. Spaces of this size and location in a Wal Mart/Home Depot Power-Center don't come-up very often. This restaurant in located right at the entrance to the center and it smacks you in the face when you pull into this BIG BOX shopping center to go to Wal Mart or Home Depot. The outside patio is more than 1,800 Sq. Ft. and is very visible from the entrance and throughout the whole center. The interior space is over 4,441 Sq. Ft. and features a long, long, long bar with seating at the bar for more than 25 people. The interior and exterior seating exceeds 200. There are hundreds of parking spaces surrounding the building.